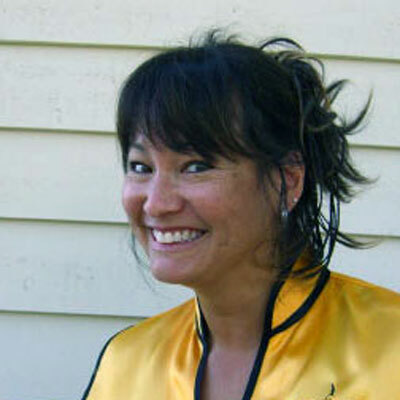 Steffani Tomizaki started kung fu in 2000, after an attempted kidnapping by gunpoint. She has been training forms, weapons, sparring, lion dance and shuai chiao. She started teaching kung fu in 2004. She is currently a 7th degree Black Belt. Steffani has competed nationally in San Francisco, Seattle, Dallas, Oakland and Concord, where she has wonnumerous 1st place awards in forms and weapons and has been runner-up Grand Champion twice. She was selected to represent the USA at the 2012 World Chin Woo Championship in Tianjin, China. She has been performing since 2002, demonstrating self-defense techniques, weapons, forms and shuai chiao. She’s also performed many times in Brazil. Besides teaching kung fu, Steffani has also been teaching self-defense classes for over 10 years to women and girls. She’s really passionate about this, as ” Self-defense training helped me survive an attack. Not the fighting part, but the thinking part.” She’s taught new mothers, girl scouts, many graduating high school seniors, missionaries getting ready to travel, and more. She has worked in conjunction with local police officers and crisis counselors. Prior to kung fu, Steffani was active in Taiko, dance and competitive soccer. Steffani is also very active in the community. She coached youth soccer for over 17 years. She has also volunteered her time for over 13 years in the local elementary, middle and high school, teaching PEP, Smart Start and Youth Educators. These are programs that helps educate our youth on making healthy decisions regarding alcohol, tobacco, drugs and refusal skills. She also teaches parents to become volunteers thru the Center for Human Development. Steffani sees the numerous benefits achieved from the training at Tomizaki’s Champions Kung Fu; from increased concentration, better grades, self-confidence, self-control, respect, health, coordination and improvement in other sports & activities.